Construction: Wood and wood veneers, featuring solid wood bases, shaped mouldings and pilasters and Ginger Cherry finsh. Top surfaces are detailed with decorative border inlay veneer and walnut banding with a NC lacer topcoat. Drawers: Drawers have solid wood sides and backs with veneer and veneer banded fronts and a 3-ply veneer bottom. Drawer interiors are sealed. All drawers feature dovetail construction and are suspended on metal, ball bearing slides. All box drawers are fully extending and have a 100lb. load bearing rating. Drawers feature plated brass finished pulls. File Drawers: File drawers are fully extending and have a 150lb. load bearing rating. Drawers are equipped with metal rods for letter or legal sized side-to-side or front-to-back letter hanging file folders, and are fully extending. 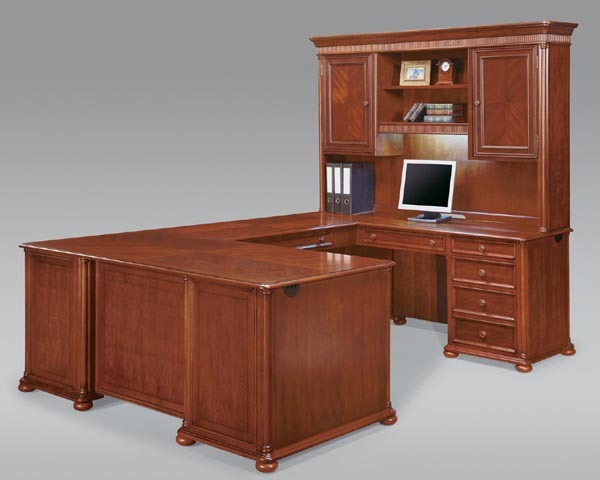 Adjustable Levelers: All desks, file cabinets, credenzas have adjustable levelers. DMI Office Furniture is currently on sale, 50% Off. Shipping is additional. For a business delivery with a dock. (The freight company will get the cartons to the end of the trailer and then it is your responsibility to get the furniture off the truck). By List Price from 0 to $3,000 freight charge of $200, $3,001 to $6,000 freight charge of $300, $6,001 to $9,000 freight charge of $400, $9,001 to $12,000 freight charge of $500, $12,001 to $15,000 freight charge of $600, $15,001 to $18,000 freight charge of $700, $18,001 to $21,000 freight charge of $800, above $21,000 call for quote. Zone 2 add $200. Residential delivery add $100. Lift gates are available for additional charge, call 856-368-9085 for details.